Your car's engine needs two primary ingredients in order to run, oxygen and gasoline. The proper mixture of these things helps create an efficient and smooth running motor. Since gas is what you regularly put in your tank, it's obvious that it is needed for the car to operate. So what happens if the tank is full but no gas gets to the engine? Well, you won't be going anywhere. Gas can be prevented from reaching the combustion chamber, where it mixes with air, for a number of reasons. The following are the three most common causes of gas delivery failure in modern automobiles. The fuel pump is what is responsible for getting liquid gasoline from the gas tank to the engine. If the pump is unable to do its job, or not do it well enough, it is probable that the vehicle won't run, or run very poorly. A fuel pump can fail due to electrical issues or mechanical problems. If the fuel pump has failed and you try and start your car, the engine will turn over and over, but won't fire up. As gas is pumped from the tank to the engine it must pass through a fuel filter, where motor-damaging impurities are removed from the liquid. Most fuel filters can last for multiple years, but if you fail to have it changed as it becomes dirtied, it will become increasingly difficult for gas to make it to the motor. This is a relatively simple part to replace on most cars and trucks, but in some newer models it requires special tools. After gas passes through the fuel filter it will be fed to the fuel injectors. These injectors spray gas directly into the combustion chambers. Over time the injectors can become gummed up, which will hinder their spray power. Using injection cleaning products can help prevent this from happening. If your car's engine turns over but won't start, make sure you have gas in the tank. If you do, then it may be the case that the gas isn't getting to the engine. 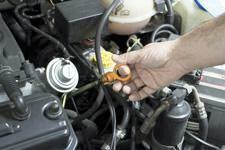 For expert fuel system repair in Asheville for any make and model be sure to contact The Organic Mechanic. Our auto repair team will diagnose the issue and have you back behind the wheel in no time. Give us a call today at (828) 232-8120 to make an appointment for superior auto repair in Asheville or the surrounding area.